P’n’F Travel Towers gave us a hand doing some tree removals in Cockatoo today. There were three dead trees to be cut down, all but one was too dangerous to climb. If you are thinking about getting a tree cut down at your property, the cost of the job is affected by the complexity of the tree. If the tree has been dead for a long time, climbing the tree can be slow due to the increase risk. If you have a large enough driveway, a suitably sized travel tower can be used to help expedite the process. Contrary to common belief, when this is possible, the cost of the removal can be lower. This may give you the customer additional budget to have things like chipping done. The exception to this is when companies are only interested in doing a particular type of work i.e. 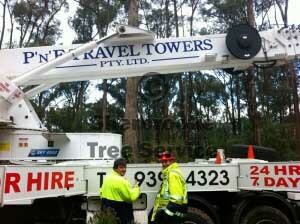 tree climbing OR travel tower removal. As a customer, it is hard to discern the difference but this is why it is worth exploring the companies expertise in your particular job. The size of the tree being removed or pruned, is NOT always proportional to the price! 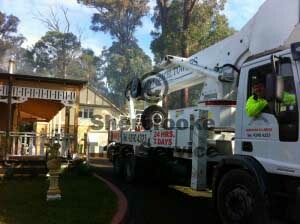 Sherbrooke Tree Service has expertise in both tree climbing and travel tower removals. We take pride in applying the right tree removal technique, to the right job. The first tree was a tall, vertical and very dead tree. 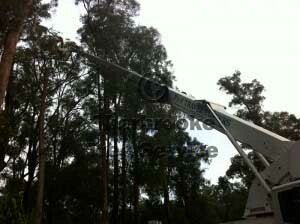 To remove we set the cherry picker up, and blocked the tree down, from top to bottom. The second dead tree was tall, with a multi-stem leaning over the absorption trench. Using ropes and tree cutting techniques, we removed the tree to ground level without damage to garden or absorption area. The third dead tree was hanging over a carpark. It was a wide spreading, heavy leaning tree. Climbing was possible, but suitable high points were scarce and progress through the tree’s canopy would have been slow. After removing the three trees from the house in Cockatoo, we moved up the road to remove another two large trees.